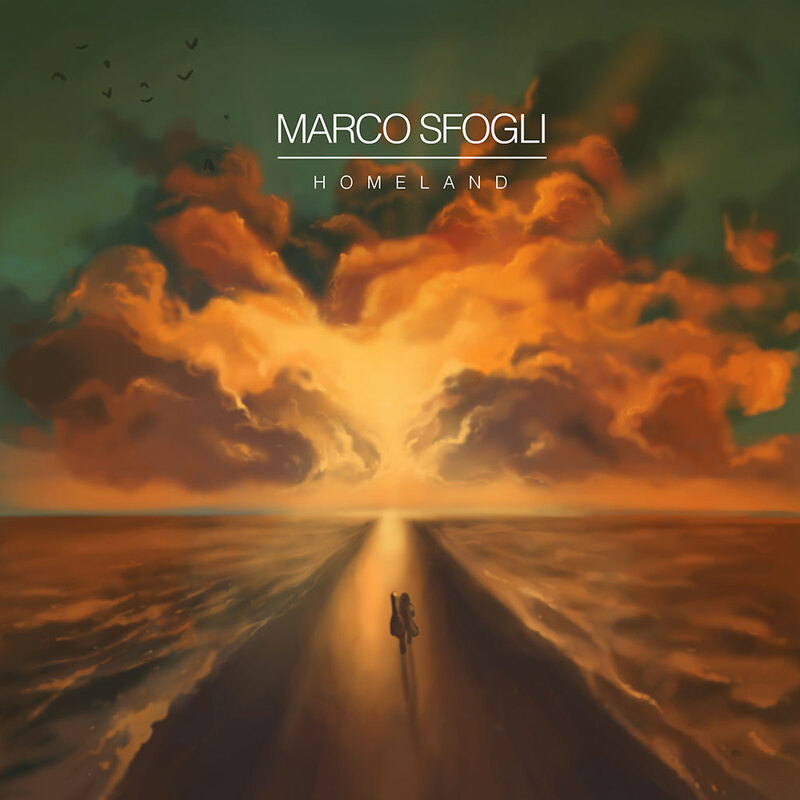 Marco Sfogli is back with fresh material in the form of a third full-length record. Homeland will definitely beckon to progheads. Marco Sfogli is an Italian guitar virtuoso who has appeared on numerous records as a guest musician and has also collaborated with Jordan Rudess and James LaBrie (more extensively with the latter). Homeland is his third solo album coming in seven years after its predecessor. There are some noticeable improvements spanning Homeland, when placed in comparison with the first two albums. Homeland sets itself apart from its predecessors firstly through its great production value. All the instruments are well-placed in the mix, nothing overlaps, nothing is drowned, and the spatial qualities of each instrument can be properly felt. The tones are really warm and crisp, the lead guitar is very sweet sounding, the drums have plenty of kick whilst sounding light, the bass fully bridges the gaps between the rest, offering a solid backbone. The piano and synth glide effortlessly throughout the album whenever they are employed. Songwriting is better than before, even though it is by no means groundbreaking. We are met with an approach that has a foundation rooted in a very 90s styled delivery. “The 12th Hour” opens up the album with a lot of bright and energetic bits that hearken to early Dream Theater tunes. This is something that appears again in “Speed Limit” and “Superwave”. This similarity would be most closely comparable to the latter half of Images and Words and while by itself it’s fine, in the context of this album it doesn’t stray far from its origin thus feeling more as a tribute – more than anything else. “Corrosion” deviates slightly from the tone of the opener, going for more of a rock feeling, while still retaining the Dream Theater-esque timbre. “Get Away With It” changes the tone of the whole narrative with a very funky vibe that’s sprinkled with jazzy overtones. “Dawn” and “Homeland” soften up the trip even further, going for what is basically your classic ballad. “Speed Limit”, “Superwave”, and “Inner Light” definitely have the most action unfolding. However they feel like mere variations of the other songs, in spite of adding a more metallic edge in certain segments. The overall feeling of the album varies in what it is and in intensity, but it doesn’t really stray from being simply upbeat and bright, while across the ballads it may feel much softer. The album doesn’t really have a specific narrative flow even though it has a certain flow as it is. The songs feel a little disconnected emotionally and to a smaller extent structurally as well. There seems to be a lack of cohesiveness from this point of view, in spite of the energetic delivery and catchy melodies. Also, while it looks like the guitar driven sound of the album rests its strength in melody, it overlooks a great deal of rhythmic variety. Marco Sfogli definitely put out a good album right here, even with its drawbacks. Although I can’t help but feel that there’s a certain lack of musical identity that permeates Homeland. It is without a doubt that people who are into more proggy things will enjoy this record. Maybe we need to wait a little longer until we can taste something more unique and authentic. Or maybe this is the aim, but considering the level of prowess held, that would be underwhelming – to say the least. Let’s hope for the best! Next PostCamilla Sparksss is Bringing a Spark of Joy with Her New Album!